We’re going to leave it for a few months – probably until summer – before we paint it. Advice was to leave it a year, but my level of impatience is too high for that, so we’re compromising at 8 months. 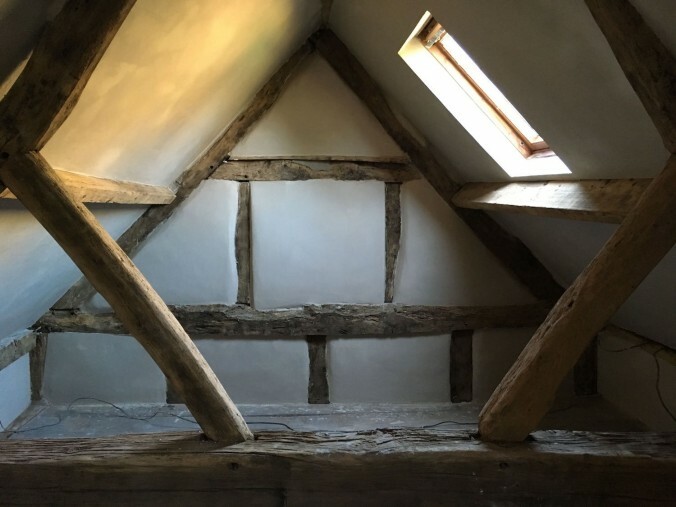 We’ll be using clay-based paint designed to go onto lime plaster, so there’ll probably be lots of posts about which colours we like and how we can’t decide. 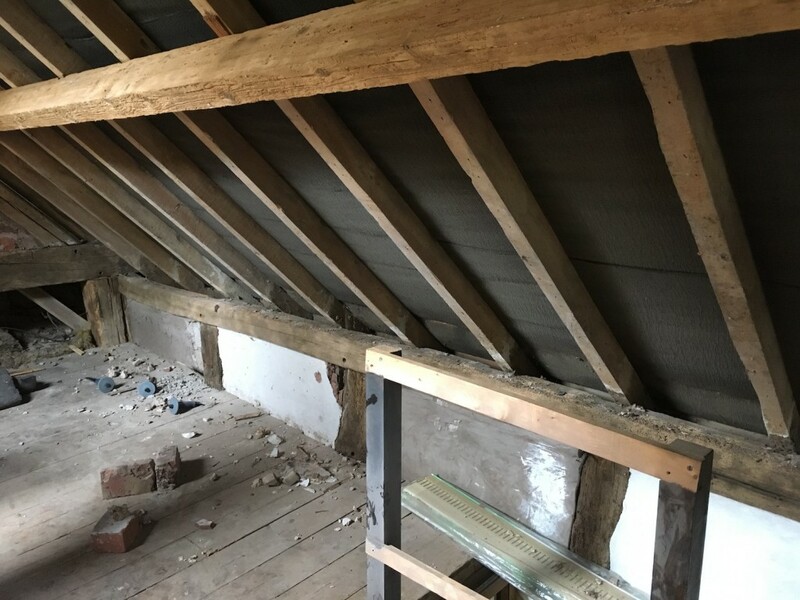 Next job in the attic is to finish sanding and oiling the timbers. 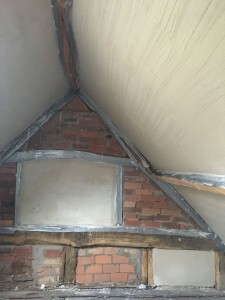 We need to lightly sand all the timbers, in fact, to take the plaster off. Then we’ll be putting in the electrics. 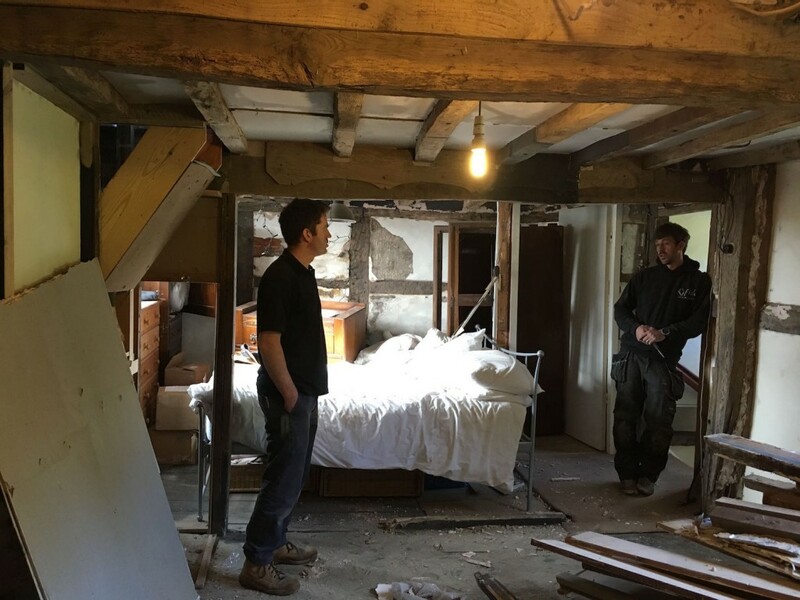 Yes, yes, we should have done all that before the plasterers arrived but things got on top of us and we got overexcited about the plastering. 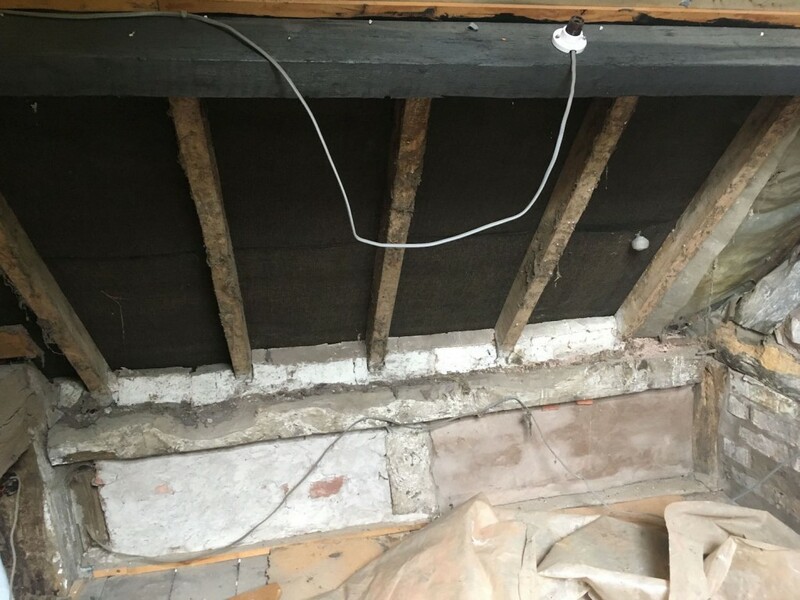 So we’ll be looking for surface-mount LED spotlights for the ceiling, and using that gorgeous old-fashioned braided flex for the wiring that’ll be exposed. After Christmas – if we’ve got enough cash! 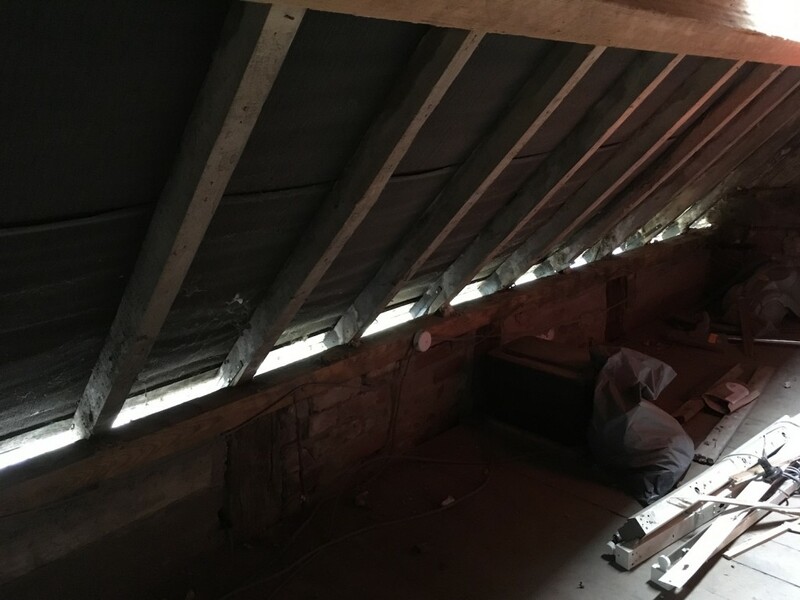 – we’ll be getting the window in the wonky room knocked back in and the 8″x8″ beams installed to reinforce the attic floor. We got John and his team from PlasLime to come and do the work, and they were brilliant. A total delight to have around the place, and really careful about keeping everything as clean and tidy as possible. We were pleasantly surprised at how little dust there was. The bill was huge… but it was totally worth it. Beans on toast until springtime. So, after all the mess and preparation and planning and mind-changing, we’re finally getting plastered. 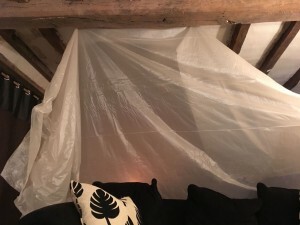 The lads turned up on Friday – proper lovely chaps they are too – and proceeded to put the scratch layer of lime plaster on the walls and ceiling in the attic. 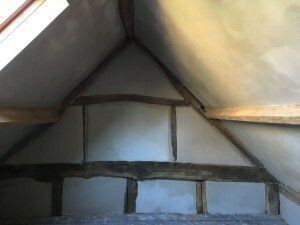 Joe and I are feeling quite smug because John, the master plasterer, kept saying what a beautiful job we’d done of the insulation and gap filling. 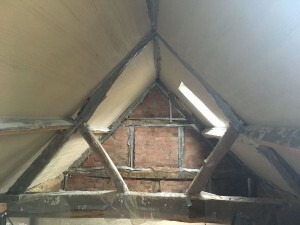 Here’s what the attic looked like on Saturday morning – it’s already taking shape, and it’s certainly more echoey now. We had some good hollow booming voices going on. So, this is the gable end that adjoins the stone part of the house. They’ve put an extra layer on that centre panel because the brickwork was a bit of a mess where the chimney goes up the wall. So they’ve built it out to tidy it up. The other gable end. There’s still daylight under that tape, but not for much longer! 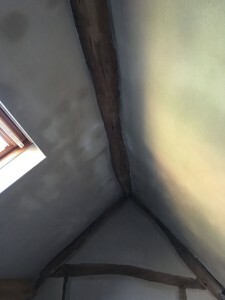 The plasterers are using special insulating lime plaster, which is not as good as using proper insulation, but is much better than just plastering onto a single skin brick wall. 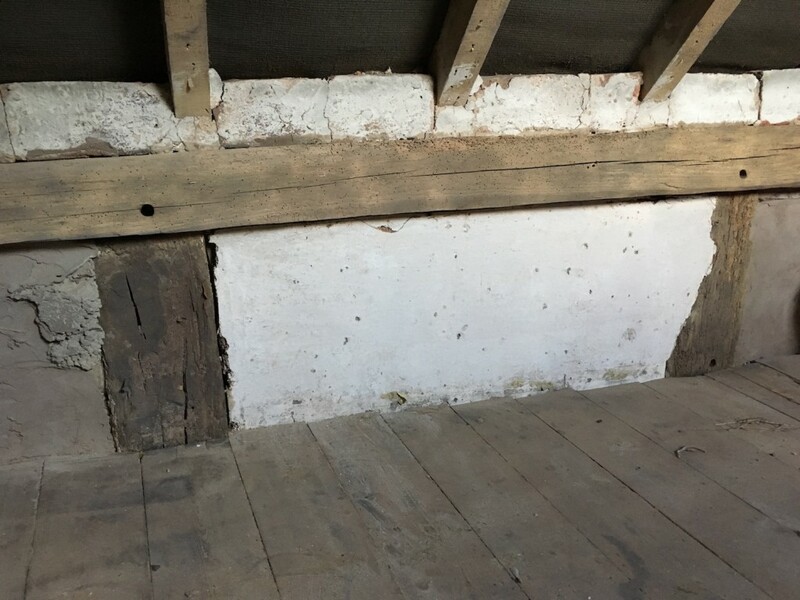 So it’s a decent compromise to keep the timbers on display, but not freeze to death in winter. 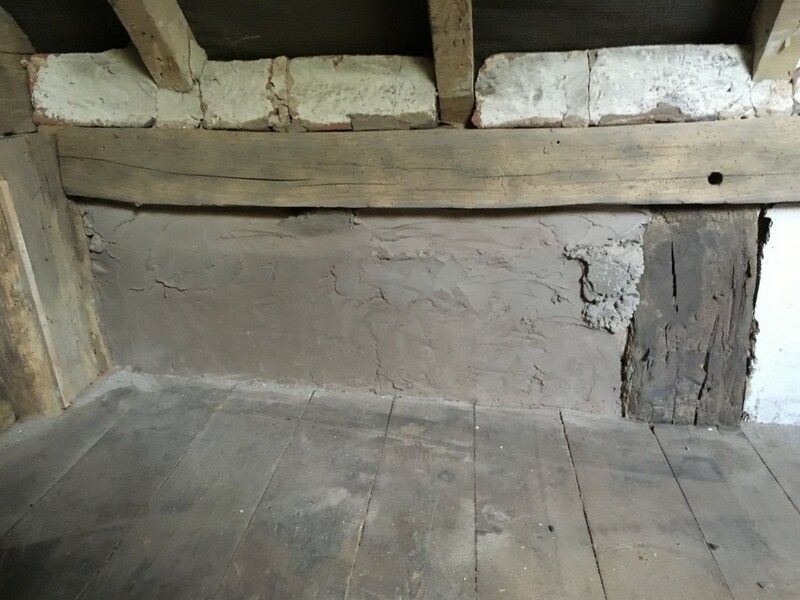 So, today they’ve been putting some of the top layer of lime plaster on and they reckon they’ll be done tomorrow. It already looks absolutely fab. I was beginning to doubt whether we’d really end up with a lovely room, but we totally will. We’ve been quiet for a while, mostly because we’ve been on holiday, but partly because we’ve been dithering. There’s quite a lot to do. And we’re beginning to realise how clueless we currently are about, well, everything. Joe and my dad – Adrian – stripped out seemingly miles of cables and nonsense from the attic. Strangely, the porch light and one of the lights in the Rayburn Room no longer work. Makes perfect sense. Pulled out an uncountable number of tacks, nails, and cable ties from all the timber. Removed the final bits of cladding and random battens. Had some more sandblasting done. 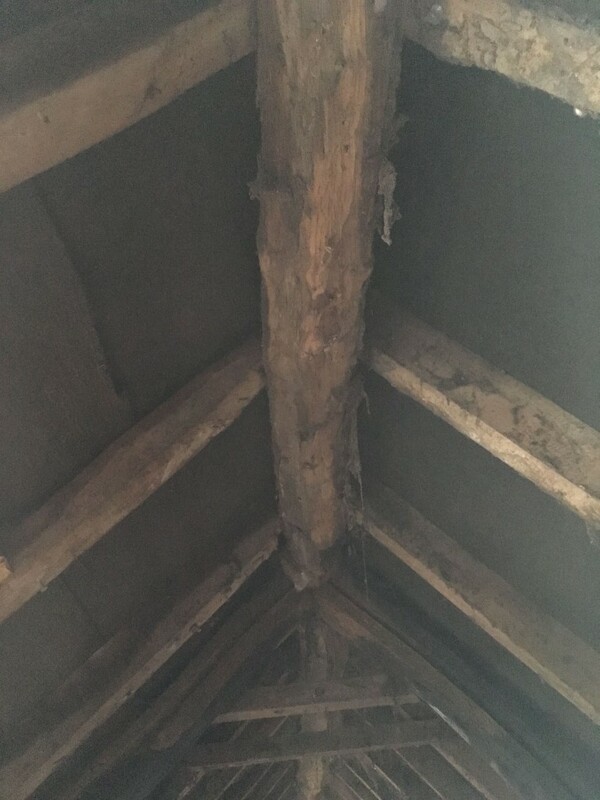 One of our dithers was over whether or not to sandblast the timbers in the attic. We have enough cash to do the floor and the staircase before Christmas, but other than that, it’s getting a bit tight. 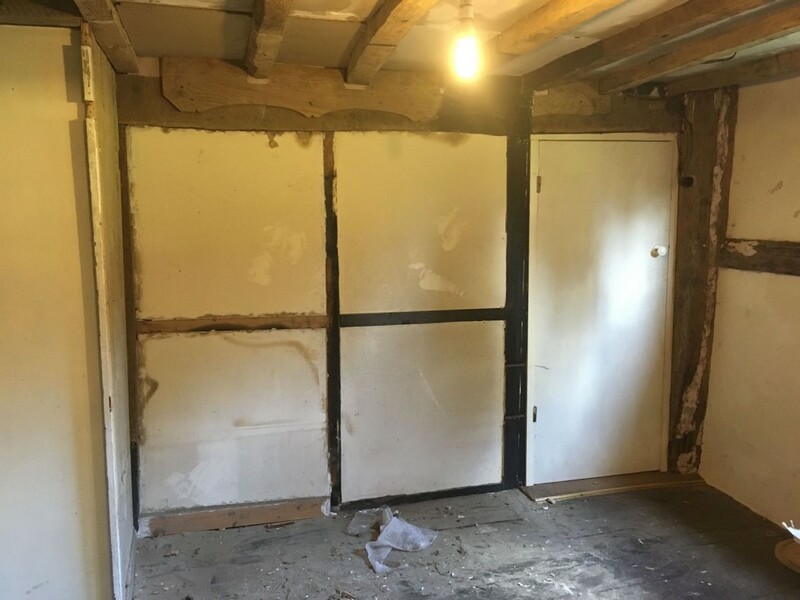 In the end, we decided to go for it because as Chris, our Super Sandblaster, pointed out: if it looks crap when we’ve done the rest of the room, we’ll be gutted. And it’ll be a right mess to do later. He did the bricks as well, which is ace because they were a right mess, and we couldn’t tell what state they were in. As it turns out, there are many types of bricks in all manner of states. Bad news for the other panels though. They’re concrete, and what looks very much like random lumps of cement. We honestly don’t know what we’re going to do with these, because if there’s no brick in the walls and we take all the concrete out, we might end up rebuilding that whole section of wall. And it’s not just the top bit in the attic – the wall continues down into the Wonky Room below. Any suggestions and advice welcome! We did start chipping away at it, but it’s super-hard and it’s going to be a nightmare. There’s another one of these on the other side of the original panel. And two more at the other end of the room. So, what do we have left to do before the floor arrives? But on Sunday, we ventured back upstairs to finish the pine-cladding destruction. 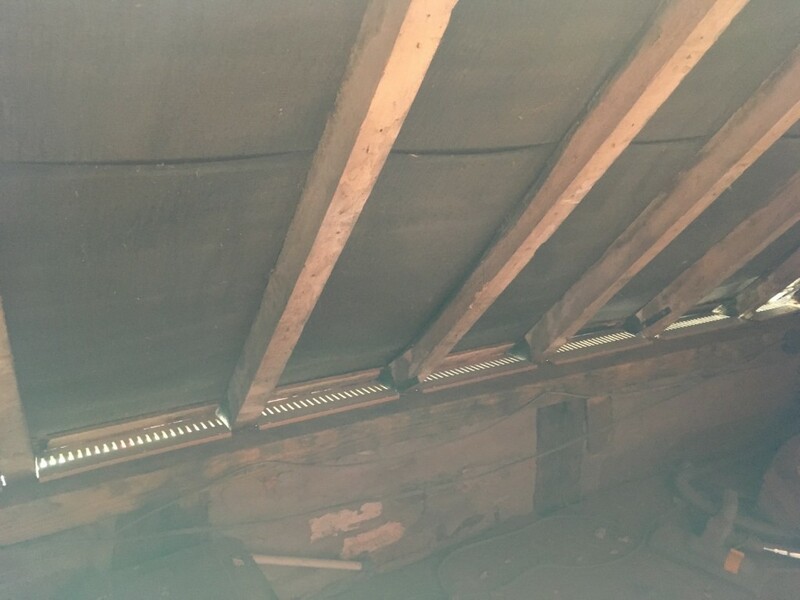 It went much as before: pine removed, many dust generated, nails removed, rafters exposed. And we discovered the ridge beam is not so much a beam as an entire tree trunk by the looks of it. We need to inspect it more closely, but so far it looks sound. 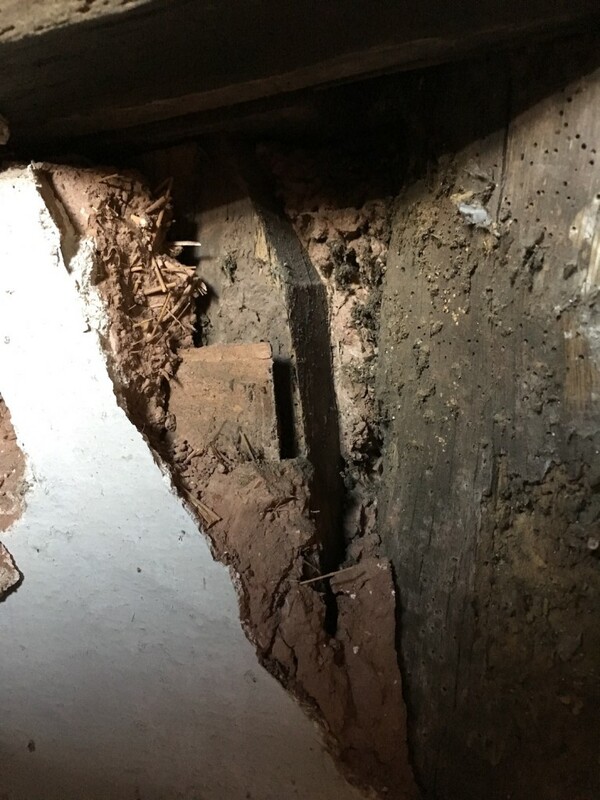 Actually, that’s another job we have to do: treat all the timber in the house for woodworm. That’ll be fun. Anyway – you can see the progress we’ve made below. It’s pretty much bare now. We need to remove the cladding corpses and as much dust, nests, and dirt as we can, then we’re ready to look at the actual improvements. We still need to pull all the electrics out as well, so we can rewire properly. 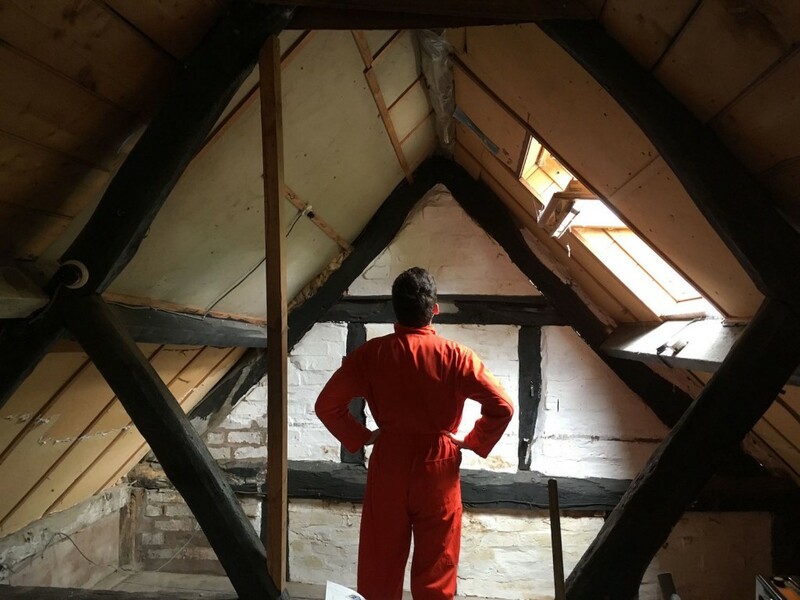 In the meantime, Fish – our floor man – is coming along on August 12 to look at the horizontal softwood timbers and advise on what we can do. And we start laying on October 24! Exciting times. We’ve done a lot of garden maintenance over the past few weeks. Mostly mowing and viciously attacking the nettles (and we’ve not made much of a dent in either, if we’re honest). 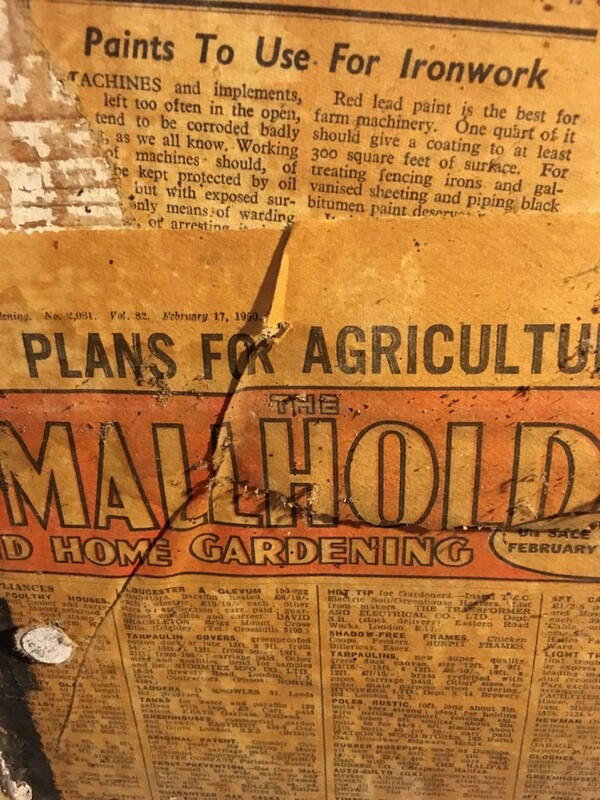 What we haven’t done much of is make progress indoors. That’s been frustrating me (Vix) because there’s so much to do. So, this past weekend, we decided to Make A Dent In The Attic. Literally. 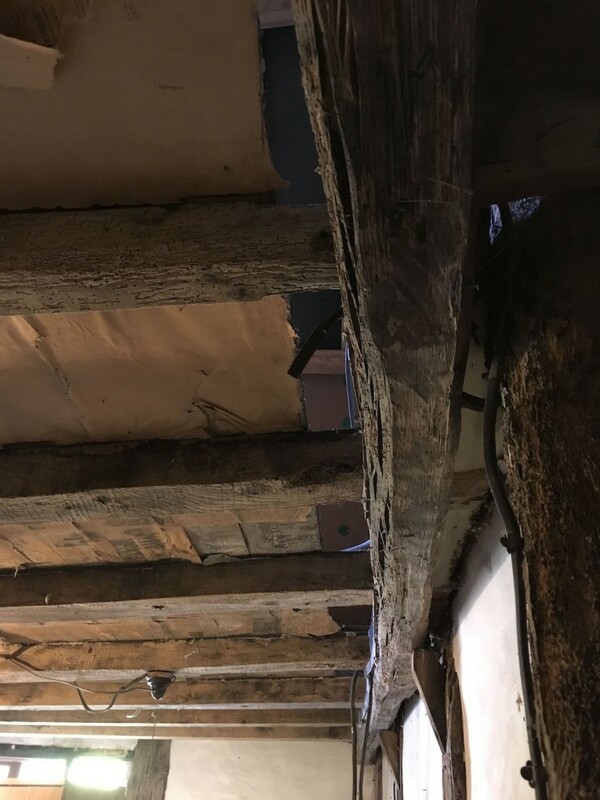 You can see there’s fibre-board laid between the beams and over the rafters. 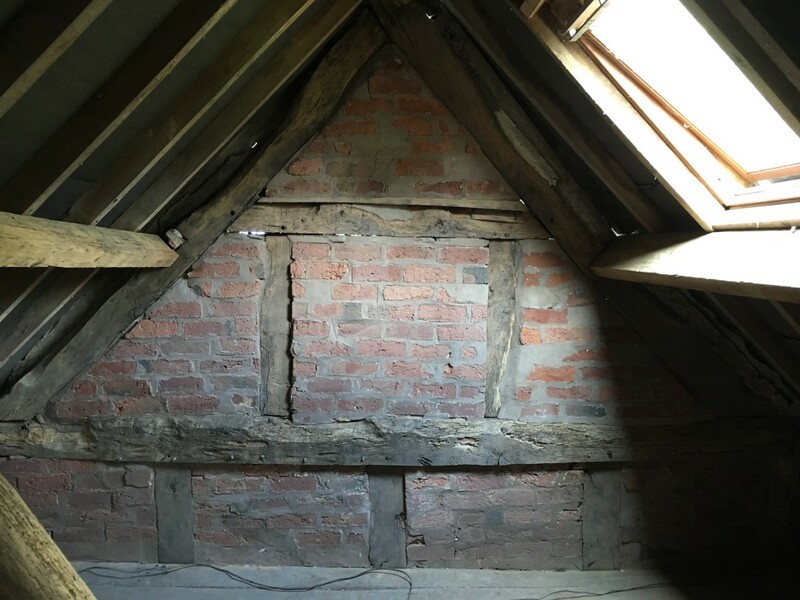 And there’s a whopping great big ridge beam that looks original (hurrah!). You can see at this end, there’s pine sauna-esque cladding running up to the “ceiling”, which has been lowered. 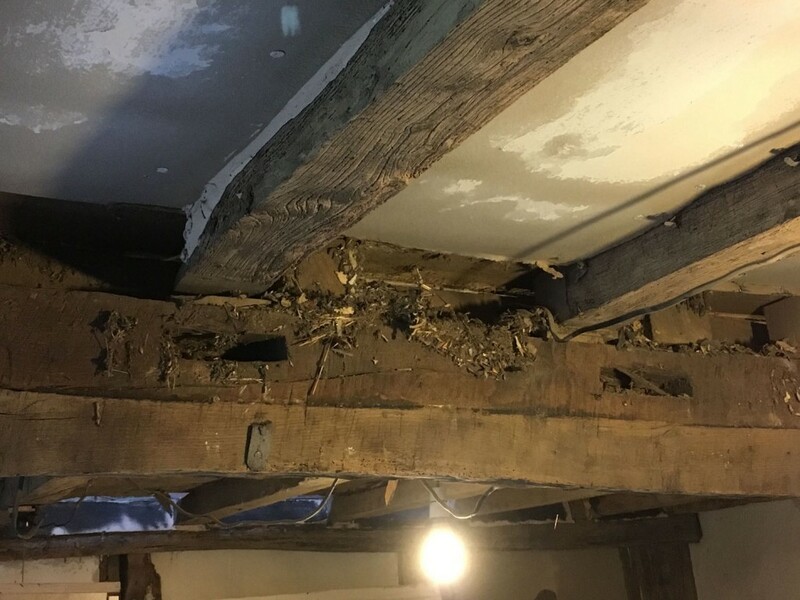 We’re going to remove all this and expose the original ridge beam. Where the paint line is, is where the old train set ran around the room. The chap who lived here had this amazing train set. He’d built an entire landscape, and it must have been quite the thing when it was going. I love miniature stuff, so I would’ve loved to have seen it. It was mostly disassembled when we moved in, so we took the rest out and gave the train tracks to Joe’s niece’s friend. Anyway – the weekend task was to rip as much of the cladding out as we could. 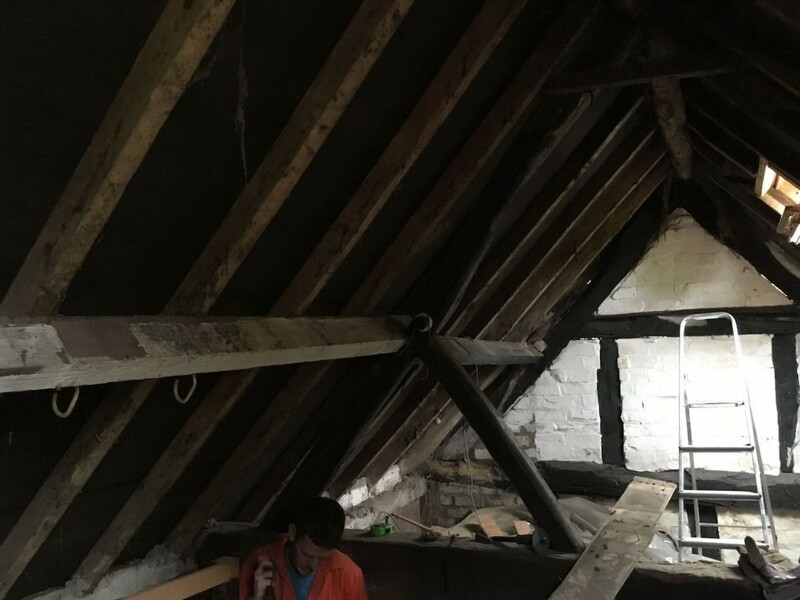 We’re stripping it right back to the rafters and then starting again. 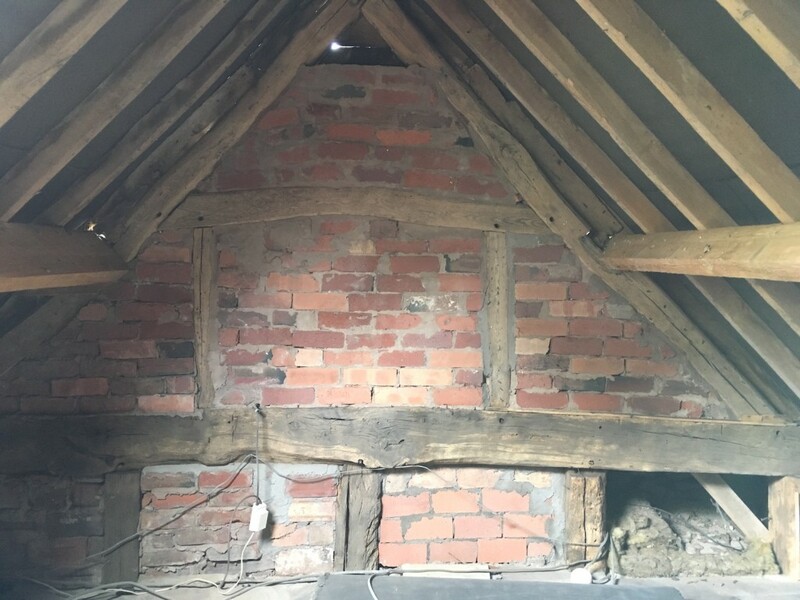 We’re also considering putting new oak beams in to support the roof, because the white ones you can see in the photos are cheap softwood. They’ve also been bodged in and are a right mess where they join at the truss. We’re not boxing them in because we want the space, so we’re considering replacing them with oak, which will look amazing and will last longer than we will. This is the old staircase opening, which we’re removing. 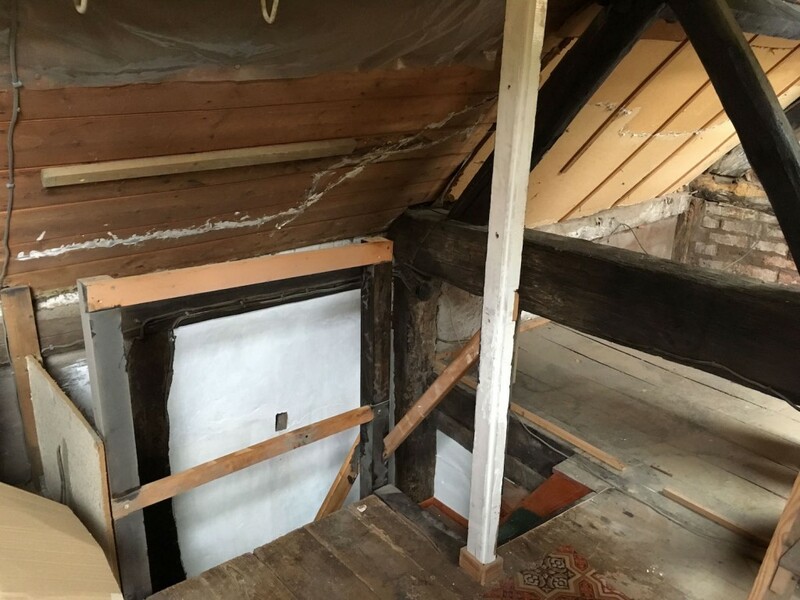 The staircase is serviceable for occasional attic use, but no good for regular use. We’re having a new solid oak staircase built by the same chap who built our friends’ beautiful new staircase. We’re widening the opening at the top and it’ll look amazing. 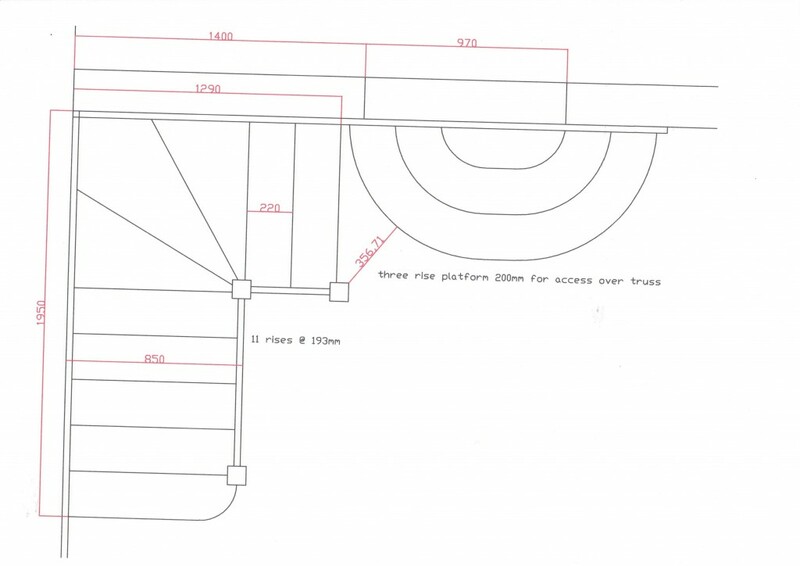 We’re also thinking we might have stairs built up to the truss so we can climb onto the beam easily then faceplant into bed from a height. Fun! This is pretty much what the sloping walls look like now. 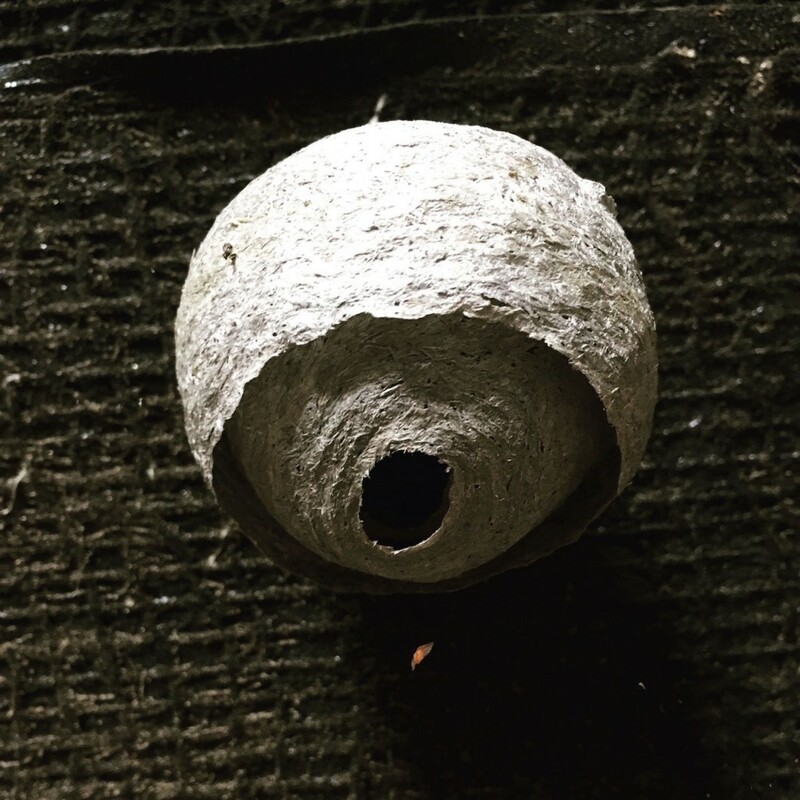 We uncovered three solitary queen wasp nests, beautifully built. And a full, gorgeous paper wasp nest. All abandoned. And bird nests. Not so much nests, actually, as an entire bird housing estate… I think that was mostly responsible for our roof insulation. 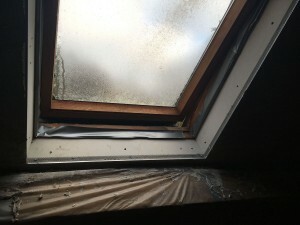 Thankfully, the roof and the weatherproofing are in really good condition. 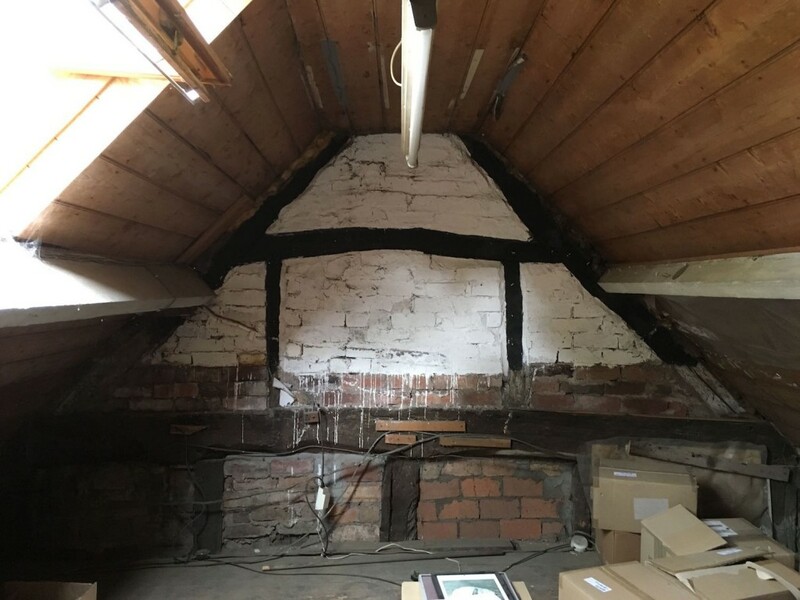 There is, however, a random course of bricks that has been placed beneath the roof where the walls join, so we’re going to need to look at that. Not least because they all move alarmingly when you at them hard. I think a soffit should be there. We’ll dig into that. We haven’t uncovered the ridge beam yet – that’s next weekend’s dirty task. 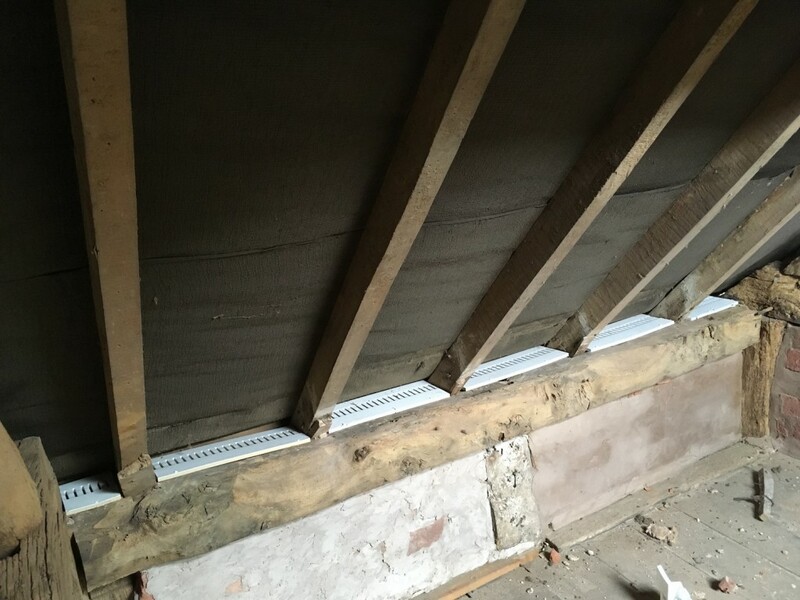 Next up: finishing the destruction, then installing new horizontal beams and starting the plastering.